View near Dulverton in Somerset. Dulverton is situated in between the Rivers Barle and Exe in Southern Exmoor and is probably best known as the setting of R. D. Blackmore’s novel Lorna Doone. 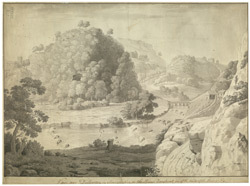 This scene depicts the River Dunsbrook one of the heads of the River Exe. The River Exe rises in northern Exmoor and flows more than 50 miles in a southerly direction to Exeter in Devon where it flows through a large Estuary to Exmouth.